A little piece of Ephraim can be yours to enjoy at Cedar Glen. This charming cottage has been fully remodeled and freshly painted in 2008. You will find new hardwood floors, new kitchen cabinets with granite countertops and all new appliances. Located in Ephraim’s historic district with glimpses of Eagle Harbor from the kitchen and living room, this cottage invites you to settle into Door County’s pace and charm; linger over breakfast in the sun room, on the front porch or in the backyard, or take a short walk to the waterfront and all else that Ephraim offers, such as Sunday evening family sing-alongs during the summer. Enjoy the quiet of beautiful Door County evenings and catch up on your reading or sleeping. If you must connect with home and the outside world, there is technology in the cottage to do so, but we hope you won’t miss any opportunities to explore Door County’s natural abundance. The cottage is simply and tastefully furnished, with plenty of natural light and color. You will find the basics you will need to be comfortable, without too much clutter. A picnic basket sits ready by the back door. Whether you have long dreamed of staying in a little white cottage in Door County’s most picturesque community, or are visiting for the first time, you are welcome at Cedar Glen. *** All stays less than 1 week or overlapping designated turnover day during peak season are subject to approval. The cottage was turn key ready bring food drinks and fishing beach and outdoor gear. 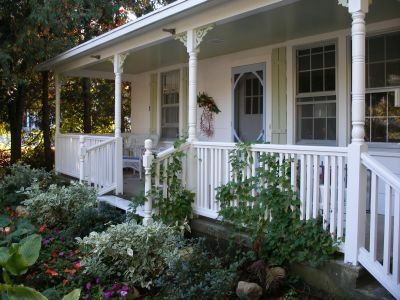 Your close to all things Door county offers or just relax in beautiful backyard or on front porch. Thank you for your wonderful review! Cedar Glen is a lovely place and we're glad you enjoyed it so much. Welcome back anytime! The decor is fresh and inviting with a lovely color palate and large windows to enjoy the gardens from inside. We kept saying all weekend "this place is SOOO cute!". The lush gardens are beautiful and well maintained. The house itself is clean and looked like we were the first to rent it. The kitchen has beautiful marble counter tops, immaculate appliances and any kitchen utensil or serving bowl one could wish for. The pictures do not do it justice. My family of 4 stayed here for a week over the 4th of July. We loved being in a quiet neighborhood, being close to the water and Peninsula State Park and having the ability to walk into town. It was the perfect central location on the Door. The cottage was clean, comfortable and up to date. We absolutely loved it. We will be back!